What began as a one-day professional bodybuilding competition in Columbus, Ohio in 1989 has grown into the world’s largest multi-sport fitness weekend, with four days of sports competitions, demonstrations, seminars, entertainment and the latest fitness products. The Arnold Sports Festival story dates to 1970, when Columbus sports promoter Jim Lorimer invited a young Austrian bodybuilder named Arnold Schwarzenegger to Columbus to compete in the Mr. World contest that was accompanying that year’s World Weightlifting Championships. Schwarzenegger won the contest, earned $1,000 and vowed to return to Columbus one day to partner with Lorimer and promote the sport of bodybuilding. After winning the Mr. Olympia contest every year between 1970-1975, Schwarzenegger was true to his word. Schwarzenegger and Lorimer promoted the Mr. Olympia contest in Columbus six times between 1976 and 1986 before founding the Arnold Classic in 1989. When Schwarzenegger was appointed the chairman of the President’s Council on Physical Fitness and Sports, he charged Lorimer to expand the scope of the Arnold Classic weekend to include other sports. Martial Arts and gymnastics were among the first added. More events have been added each year and the weekend was renamed the Arnold Sports Festival in 2006. In 2019, more than 80 sports and events featuring more than 22,000 athletes will be held at the annual celebration of health and fitness as the nation’s largest multi-sport festival celebrates its 31st Anniversary. The sports and events feature 17 Olympic sports, nine IFBB Pro League contests, the Arnold Amateur NPC Bodybuilding, Fitness, Figure, Bikini & Physique Championships and the Arnold Strongman Classic. The Arnold Sports Festival began expanding worldwide in 2011 with inaugural Arnold Classic Europe in Spain. Arnold Sports Festival South America debuted in 2013 and the first Arnold Sports Festival Australia was held in 2015. Arnold Sports Festival Africa in Johannesburg was held for the first time in 2016. COLUMBUS, OHIO – The Arnold Sports Festival, already the largest multi-sport event in the world, will grow even larger in 2019 when an estimated 22,000 athletes from 80 nations compete in a record 80 sports and events from February 28-March 3 in Columbus, Ohio. Headlining the nation’s largest multi-sport festival are professional bodybuilding and strongman competitions with the most well-built and strongest athletes in the world. These premier physique and strongman competitions are featured daily at the Greater Columbus Convention Center. The 31st Arnold Classic will be held at Battelle Grand on Saturday, March 2, along with the Bikini International, Arnold Men’s Physique and Arnold Strongman Classic Finals. Other IFBB Pro League events on the weekend include Fitness, Figure, Classic Physique, Women’s Physique and Wheelchair. New events in 2019 include Armlifting, Arnold Education, Foosball, Futsal, High School Weightlifting, Ninja Warrior, Speed Cubing and the Viking Dash Trail Runs. Sports and events at the Ohio Expo Center in 2019 include Arnold SportsWorld Kids & Teens EXPO, baton twirling, pro and amateur boxing, cheerleading & dance, futsal, gymnastics, martial arts and pickleball. The Arnold SportsWorld Kids & Teens EXPO is helping kids be more active. Attendees can try more than 20 sports, many led by Central Ohio professional sports teams. Featured events include a talent competition and teen fitness pageant. This wall-to-wall fun event for families is free for kids 14 and under at the Ohio Expo Center’s Bricker Building on Saturday, March 2 and Sunday, March 3. COLUMBUS, Ohio – The Arnold Sports Festival will hold multi-sport festivals on five continents in 2019. The Arnold Sports Festival USA will be held in Columbus, Ohio in March, followed by multi-sport festivals in Melbourne, Australia; São Paulo, Brasil; Johannesburg, South Africa; and Barcelona, Spain. The festivals in the USA, Australia and South America will affiliate with the IFBB Pro League and the National Physique Committee (NPC) while events in Africa and Europe will partner with the IFBB Elite Pro League and the International Federation of Bodybuilding. All events feature professional and amateur bodybuilding contests, strength and combat sports, a large health and fitness expo and youth events that vary from continent to continent. The Arnold Pro Strongman World Series will also be held at each worldwide festival. The 2019 Arnold Sports Festival USA will feature more than 22,000 athletes from 80 nations competing in more than 80 sports and events, including IFBB Pro League events in men’s open bodybuilding, men’s classic physique, men’s physique, fitness, figure, bikini, women’s physique and pro wheelchair. The Arnold Amateur NPC Bodybuilding, Fitness, Figure, Bikini & Physique Championships will return for a 13th year with more than 700 athletes from 70 nations. Visit www.arnoldsportsfestival.com for more information on the Arnold Sports Festival USA and all other events on the 2019 Arnold Classic Worldwide schedule. The Arnold Sports Festival will feature IFBB Pro League contests in eight divisions in 2019. Bonac, 2017 winner Cedric McMillan and 2007 champion Victor Martinez lead a field of 12 professional bodybuilders who will take the stage at the 31st Annual Arnold Classic on March 2, 2019. Brandon Curry, who won Arnold Classic South America in 2013 and Arnold Classic Australia in 2017, and Roelly Winklaar, 2018 Arnold Classic Australia winner, will also contend for the title. Mikhail Volinkin received an automatic invite for winning the 2018 Arnold Amateur. Whitney Jones, who overcame serious neck and knee injuries to win the Fitness International for the first time in 2018, is back to defend her title. She will be challenged by Kate Errington, second in Columbus in 2018, and 2018 Fitness Olympia runner-up Ryall Graber. A new champion will be crowned in Figure International as 2018 champion Candice Lewis-Carter has retired. Cydney Gillon, the two-time Figure Olympia champion who finished second in Columbus in 2017 and 2018, will be looking for her first Figure International crown. Nadia Wyatt, third at the Olympia in 2018, Bojana Vasiljevic and Jessica Reyes Padilla are also among the field of 14 contenders. There will also be a new champ in Bikini International as 2017 and 2018 winner Angelica Teixeira will not compete. Challengers for the title include 2018 runner-up Janet Layug, two-time Bikini International champion Ashley Kaltwasser and Lauralie Chapados, fresh off a second-place finish at the Bikini Olympia and four contest wins in 2018. Sonia Lewis received an automatic invite for winning the 2018 Arnold Amateur. The 31st Annual Arnold Classic, Arnold Classic Physique, Arnold Men’s Physique, Arnold Classic Pro Wheelchair, Fitness International, Figure International, Bikini International and Women’s Physique International contests will be held March 1-2, 2019 at the Greater Columbus Convention Center in Columbus, Ohio. Visit www.ticketmaster.com/arnold or 800-745-3000 for ticket information. VIP Ticket Packages and individual event tickets are available. COLUMBUS, OHIO – Defending champion Hafthor Bjornsson of Iceland; three-time winner Brian Shaw of Fort Lupton, Colo., and red-hot Martins Licis of Santa Monica, Calif., headline a field of 10 qualifiers for the 2019 Arnold Strongman Classic set for the 2019 Arnold Sports Festival in Columbus, Ohio. Bjornsson broke through to win the 2018 Arnold Strongman Classic in his seventh attempt after finishing second in 2017 and fifth in 2016. Bjornsson, the actor who plays The Mountain on the HBO hit series Game Of Thrones, backed up the victory by winning the 2018 World’s Strongest Man contest. Shaw, winner here in 2011, 2015 and 2017, hopes to reclaim the title after finishing 2nd to Bjornsson a year ago. Licis is coming off victories at Arnold Pro Strongman Europe in September 2018 and Arnold Strongman USA this past weekend on the Santa Monica Pier in Los Angeles. Licis, fourth at 2018 World’s Strongest Man, finished 8th in 2017 in his only appearance in Columbus. The 2019 Arnold Strongman Classic will be dedicated to Dr. Terry Todd, the event founder who was a weightlifting champion and founder and director of the H.J. Lutcher Stark Center for Physical Culture and Sports at the University of Texas. The 2019 Arnold Strongman Classic serves as the Arnold Pro Strongman World Series Championship. The qualifiers were determined through a series of pro strongman events held mostly in conjunction with Arnold Sports Festivals in 2018. Novikov earned his spot by winning the Arnold Amateur World Championship at the 2018 Arnold Sports Festival. Visit www.arnoldprostrongman.com for more information on the Arnold Pro Strongman World Series. Events at the 2019 Arnold Strongman Classic include: ROGUE Elephant Bar Deadlift (rounds system, with the beginning weight set at 751 pounds/340 kilos); Husafell Stone Carry (409 pounds/189 kilos for distance); Conan’s Wheel of Pain (details to be announced); Austrian Oak (430 pounds/195 kilos overhead press for reps); and the Odd Haugen Stone to Shoulder (natural stone to shoulder for reps, 410 pounds/186 kilos). COLUMBUS, OHIO – The Arnold SportsWorld Kids & Teens EXPO will be held March 2-3, 2019 in the Bricker Building at the Ohio Expo Center. Admission is included with the Daily EXPO Ticket. For the fifth straight year, the Arnold SportsWorld will present a wide variety of interactive sports demonstrations, activities, a stage with non-stop entertainment and more than 200 vendors – all under one roof. Children14 and under are admitted FREE. Arnold SportsWorld serves as the activity core for youth sports competitions and family activities at the Ohio Expo Center. Located in the Bricker Building, the 2019 Arnold SportsWorld is a fun-filled, two-day festival of sports designed for families with children of all ages. It will feature more than 20 sports areas with an action-packed schedule of challenging contests, games, hands-on demonstrations, a fun zone with zorb balls, bounce houses, bull riding, face painting, virtual reality video games and more. “The Arnold SportsWorld Kids & Teens EXPO offers parents and their children an opportunity to experience dozens of sports and activities and hopefully allow the children to discover a sport that they wish to pursue,” said Jim Lorimer, who co-founded the Arnold Sports Festival with Gov. Arnold Schwarzenegger in 1989. Demonstration areas will be hosted by organizations such as the Columbus Blue Jackets (hockey), Columbus Clippers (baseball), Columbus Eagles (soccer), Pro Football Hall of Fame and The Difference (football), Ohio Machine (lacrosse), Royal Arts Fencing Academy, Cyclone Gymnastics, Ace Archers (archery), United States Tennis Association/Midwest Section (tennis), Columbus Recreation and Parks (weightlifting), Spartan Race, and YMCA of Central Ohio (basketball). In addition to the Arnold SportsWorld Kids & Teen Expo, the Ohio Expo Center will also have sports competitions in various buildings including: baton twirling, boxing, cheerleading & dance, futsal, gymnastics and martial arts. Meet & Greets: Saturday, March 2 from 2:30-3:30 p.m. at the Kids & Teen EXPO will feature a Salute to Veterans with appearances by: Randy Couture-Army Sgt./MMA Legend/Actor, Tim Kennedy-Special Forces/Actor, David Goggins-Navy Seal/Ranger and Air Force Tactical Unit/World Record Holder/Triathlon athlete/Author, Rocky Bleier-Army/Wounded Veteran/4-time Super Bowl Champion Steelers. Sunday, March 3 from 2:30-3:30 p.m. will have American Ninja Warriors Michelle Warnky and Drew Drechsel. Arnold SportsWorld, in partnership with Sunny95 and Mix 107.9, will also feature the Arnold’s Quest For Talent Competition with emcee Chris Kirkpatrick of NSYNC and Andre Styles of Mix 107.9. Finals will be held at 1 p.m. Saturday, March 2, 2019 at Arnold SportsWorld. Awards include a $2,500 Rotary Scholarship, lunch with Arnold, a tablet and more. Arnold SportsWorld in partnership with ABC 6, will also host the Miss Arnold Fitness Pageant at 11:45 a.m. on Sunday, March 3, 2019. Emcees include ABC 6 anchor Katie McKee and Chris Kirkpatrick of NSYNC. For more information, go to www.arnoldpageant.com. Participants compete for a $10,000 prize package. The Arnold SportsWorld Kids & Teens EXPO will be open from 9 a.m.-6 p.m. on Saturday, March 2 and from 10 a.m.-5 p.m. on Sunday, March 3. The event will also feature stage entertainment for two days. Admission to the Arnold SportsWorld Kids & Teens EXPO and all events at the Ohio Expo Center is included in the Daily EXPO Ticket $20 at the door. Children 14 and under are FREE. Parking at the Ohio Expo Center will be $10 and FREE Arnold Express Shuttles will run between the Ohio Expo Center and the Greater Columbus Convention Center Friday, March 1 from 7 a.m.-11:30 p.m.; Saturday, March 2 from 7 a.m.-2:30 a.m. (Sun); and Sunday, March 3 from 7 a.m.-6 p.m. Combat Sports: Pro/Am MMA Festival: The eighth-annual event will feature the Iron Tiger Fight Series in 2019 and will be held at 7:30 p.m. on Friday, March 1 at Express Live!. Doors open at 6 p.m. Tickets are $35 and $40. Professional Boxing: At the Ohio Expo Center: Arnold Championship Boxing features an exciting night of action-packed professional boxing with 11 bouts at the Voinovich Center. Main Event, Heavyweights Junior Fa of New Zealand (16-0) vs. Newfel Ouatah of France (17-2). Co-Main Event NABA WBA USA Title Fight Jamie Walker of Columbus, Ohio vs. Dan Karpency of Pittsburgh. 50+ DanceSport: The 10th Arnold 50+ DanceSport Challenge, at the Sheraton Capitol Square, will feature competitions exclusively for dancers age 50 and better. There are competitions in all levels and styles, including pro/am and am/am, solos, formations and multi-dance events. Axe Throwing: The 2nd annual WATL Arnold Classic Championship takes place at Throw Nation on Saturday, March 2 in 2019. The open-to all-comers event awards the winner with $1,000 and the Arnold WATL Championship Belt. Baton Twirling: At the Ohio Expo Center: The 4th Arnold Baton Twirling Championships will feature two events in 2019. Arnold Baton Twirling Championships Saturday, March 2 and the NBTA Miss Majorette of Ohio Sunday, March 3, both at the Ohio Expo Center, Kasich Hall. Disc Golf: The 5th Arnold Disc Open hosted by Columbus Disc Flyers Club is a two-day event that features rounds of 18 holes at the Walnut Hill Disc Golf Course and field competitions in distance, accuracy and putting. Foosball *NEW*: The Arnold Foosball Championships will be held at the Arnold Sports Festival for the first time in 2019. Competitions in foosball, a fast and fun game that most anyone can play, will be held March 1-3 at the Greater Columbus Convention Center, Eisenman & Trott Rooms. Futsal: At the Ohio Expo Center! *NEW*: The first Annual Arnold Futsal Classic presented by Columbus Futsal will debut March 2-3, 2019 at the Taft Coliseum at the Ohio Expo Center. Futsal is similar to soccer, played five on five on a smaller, typically indoor, court with a low bounce ball. Handball Showcase: Games will be held on Saturday, March 2 8 a.m.-7 p.m. and Sunday, March 3 from 8 a.m.-5 p.m. on Sunday, March 3. All games will be played at the RPAC (Recreation and Physical Activity Center) at the Ohio State University. High School Weightlifting: At the Ohio Expo Center! *NEW* Will be held for the first time in 2019 at the Arnold SportsWorld Kids & Teens EXPO at the Ohio Expo Center March 2-3. Indoor Triathlon, Duathlon, Triathlon: The 4th Annual event will take place on Saturday, March 2 at Premier at Sawmill Athletic Club. Swimming will be done in the pool, cycling will be on Spinner NXT bike, ergs will be indoors and the run will be outdoors on paved surfaces. Kettlebell: For the first time the sport of kettlebell will be contested at the Arnold Sports Festival. More than 150 competitors from around the world are expected to compete in five competitions with various lifts with winners getting more reps in the allotted time. The competitions are March 1-3 in room A120 at the Columbus Convention Center. Miss Arnold Fitness Pageant: At the Ohio Expo Center: This year’s competition will feature two divisions, a Teen Division for contestants ages 14-19 and a new Miss Division for contestants ages 20-29. Both divisions will be judged in five rounds: interview, evening gown, fitness talent, athletic wear and onstage question. Ninja Warrior *NEW*: Arnold Ninja Warrior will be held at the Arnold Sports Festival for the first time in 2019. The course will be inside the Arnold Fitness EXPO and held March 1-3. 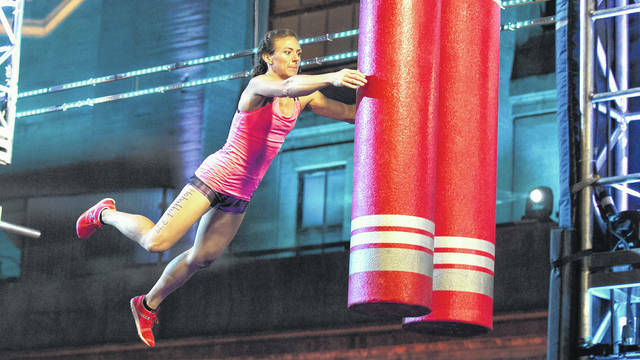 The event is hosted by Michelle Warnky, a star on the NBC-hit American Ninja Warrior. Pickleball: The Arnold Pickleball Smash Classic will be held Sunday, March 3 at the Elysium Tennis in Plain City, Ohio. The one-day tournament will feature multiple events at various skill levels. Pole Fitness: The sport of Pole Fitness will return to the Arnold Sports Festival with two competitions including the 6th PCS Championship (pro) and the 5th PCS Pole Open (amateur) at the Greater Columbus Convention Center. Spartan Race: Spartan Race leads the charge in Obstacle Course Racing. They will be set up in two locations an adult course at the Convention Center and kids course at the Ohio Expo Center. Swimming: The nation’s best masters swimmers will be at the New Albany High School Natatorium for the 6th Annual Arnold Swimming Championships Saturday, March 2. Youth DanceSport: The Arnold Youth DanceSport Classic is an experience in elegance. 1,200 of the nation’s best youth through collegiate DanceSport athletes glide with grace in elaborate costumes as they compete for top scholarship prizes at the Hyatt Regency Ballroom. Check https://www.arnoldsportsfestival.com/schedule/ for more details.